Reference: ‘Poor Basic Skills 'Costing Firms'’, BBC News, 20 February, 2007. 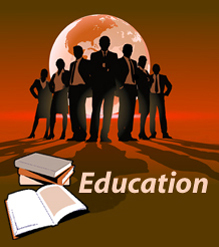 Businesses believe that the poor basic skills of school graduates is costing them money. A survey of UK employers showed that they believed that millions of workers were costing their companies money because of literacy and numeracy mistakes. Reference: David J. Hoff, ‘Big Business Goes to Bat for NCLB’, Education Week, 18 October, 2006.
Business leaders in the US see business as the “largest consumer of American education” and they “are now more prominent and more focused on specific details than ever before”. Reference: ‘Key Talking Points’, Business Coalition for Student Achievement, 2007. The US-based Business Coalition for Student Achievement claims that businesses lose $2.3 billion a year because a lack of maths and reading skills are reducing their productivity. Reference: Heather-Jane Robertson,‘Traders and Travellers: Public Education in a Corporate-Dominated Culture’, Ottawa, Canadian Teachers' Federation, May 1995. Reference: Norman R. Augustine, ‘A New Business Agenda for Improving U.S. Schools’, Issues in Science and Technology, vol 13, no 3, 1997. Reference: Nancy J. Perry, ‘The Education Crisis: What Business Can Do’, Fortune, 4 July 1988. Reference: Nancy J. Perry, ‘How to Help America's Schools’, Fortune, 4 December 1989. In 1989 Fortune magazine argued: “Business needs to do a better job of telling our schools what it wants and expects from graduates” including “more emphasis on the basics – reading, writing and arithmetic” and better vocational training. Reference: Nancy J. Perry, ‘Where We Go from Here’, Fortune, 21 October 1991.